“A Most Violent Year” echoes some of our most beloved gangster movies in tone and aesthetics, with leading man Oscar Isaac looking as suave and self-assured as any made man. However, this isn’t so much a gangster movie as it is a movie about not wanting to be a gangster. Abel Morales (Oscar Isaac) just wants to run an honest business and better himself, in spite of the fact that he’s married a mobster’s daughter and is under investigation from the police, but no matter how hard he tries he simply cannot change the world around him. This is a film about adapting to dangerous surroundings in order to survive and thrive, and it succeeds on many levels, particularly in making its morally grey characters both likeable and entertaining. The movie is about Morales, and his struggle to run a successful oil business in a crime ridden New York City. Along the way we see him attempt to balance the various issues in his life, as he does his utmost to be a loving husband whilst facing a precarious criminal investigation, and faces a power struggle against his dangerous competitors whilst trying to secure funding for his latest business expansion. Meanwhile, his workers are afraid to work, because they are assaulted regularly during their deliveries, and it’s Morales’ job to convince them to carry on doing what they are paid to do in the right way, despite the fact that they could potentially be putting their lives on the line. 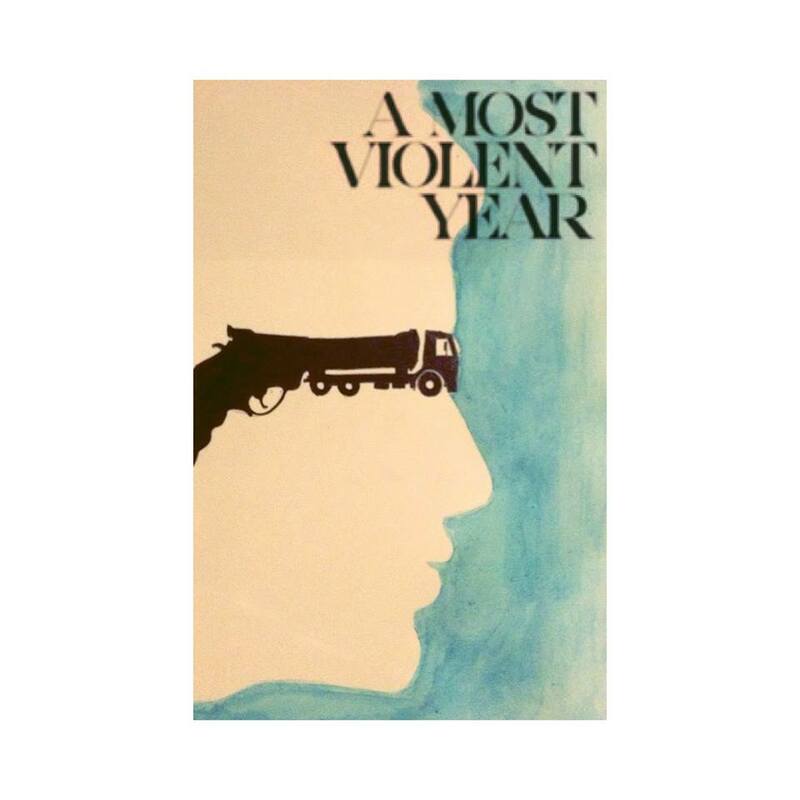 The title refers to New York City in 1981, as the year was statistically an extremely violent one in that particular setting’s history. The themes of violence and danger are clearly evident in “A Most Violent Year”, which reaffirms the idea that no one in this place is truly safe. There’s a constant sense of foreboding as the movie progresses, which is mainly down to the bleak colour palette on display throughout, so you’re always waiting for something despicable to happen. The thing that I was most impressed with in this movie was the intelligent decisions that were constantly being made. For example, there were many scenes in which a radio was playing in the background, usually as Morales was facing a difficult situation or struggling to cope with his dire circumstances, and if you listen carefully enough you will notice that the speaker was always telling a story of an unfortunate person that had been robbed, injured, or worse. Little details like this really make me feel excited by a film, and make me want to give it the time of day. However, this also leads into the most problematic aspect of “A Most Violent Year”, because the quality of the filmmaking falsely led me to believe that there was a bit more going on. I was always waiting for a twist, for something to change the film and make it all come together, but sadly the movie played the same note over and over and this became slightly dull by the end. I really liked this film, and it showcased a lot of potential, but it constantly simmers and never reaches the boil. Morales needed to be more than he was, he needed a compelling arc through the course of the movie, a significant change, but he didn’t develop enough for me. He couldn’t became the villain and become something more than he was when the film began, but sadly he was a little too ordinary for my liking. The performances were all very good, and they made the movie what it was, but ‘good’ really is the key word. The performances, just like the film itself, were acceptable and enjoyable, but they didn’t push to that level of quality that they clearly could’ve done. Oscar Isaac was great, as he often is, giving his character real life and portraying Morales’ conflicting emotions brilliantly. Morales as a character was obsessed with being the best he could be and making an honest man of himself, but he knew that to do the former he might have to sacrifice the latter. The virtue of having Oscar Isaac as your leading man is that he can demonstrate this internal struggle thoughtfully and carefully, without the need for overly simplistic dialogue. Jessica Chastain is back to her best, following what I considered to be a poor performance in “Interstellar”. I’ve never really seen her as this type of character before, because usually she plays a moral and likeable character, so it was interesting to see whether or not she could pull it off. In this film she plays Anna Morales, a powerful and confident woman, and she does so in an incredibly convincing manner. She’s fast talking, sharp, and she really is the woman behind the man. She’s a gangster’s daughter at heart; she wants what she wants and she’s used to getting it, which makes her dynamic with Abel all the more interesting, because he’s unwilling to go against his values when making headway in his profession, and she sees this nobility as a sign of weakness. This leads to conflict between the two and a great deal of frustration on both sides, but what makes Chastain’s performance noteworthy is that despite her evident annoyance, her love for Abel is still at the forefront and there for all to see. That could’ve easily been lost if the part had been played by a less capable actress, but due to Chastain’s intelligence and her chemistry with Isaac, their relationship remained endearing throughout the film. If I ask you to think of great cinema and television with this kind of tone, you might suggest such pieces as “Goodfellas”, “The Godfather” and “The Sopranos”, and I think you’d be right to make those comparisons. This film certainly seems to take some kind of inspiration from those works of art, and as you watch you can’t help but think of just how fantastic both of these actors would’ve been in those titles. The characters were interesting because they were constantly scheming and driven by their own personal needs. Morales was desperate to be a perfect man with a credible business, and yet there was still something incredibly crooked about him. His drive and his passion felt feral and vicious, which never really sat right with me. He sought to be good, there’s no doubt about that, and he acted on that for the majority of the film, but what he really wanted, the feeling bubbling inside of him, that’s anyone’s guess. What I took from the film was that Morales was more of a monster than he ever let on, and that given the right kind of push he would’ve snapped and bit back at all those who’d harmed him. His ideals were present and pushed to the forefront, but I felt that they were covering the sinister side of his personality, and that what he wanted to be was more of an idea than the reality. Despite the fact that I enjoyed this film, I felt that we weren’t told everything that we should’ve been in order to fully grasp the story. I think that this was intentional at certain points, because we weren’t meant to know who was stealing Morales’ oil, and perhaps we didn’t need to. However, I feel that we really could’ve done with more context on who Abel was, because we never got to know of his background, which meant that we didn’t know why he held such passionate views. We also could’ve done with more information about Anna’s father and her past, because that’s where the real interest in the story was; we knew that these things were impacting on what we were watching, but what we wanted to know was what exactly happened to get these people to the point at which they were at. I feel these stories would’ve been more interesting than the one I paid to see. The film ended in a slightly abrupt and anti-climactic manner, but I enjoyed it for what it was worth. The story was concluded in a satisfying way, because the main aspects of the narrative were resolved, and the way that Abel and Anna’s life would continue was clear enough. Every now and again that kind of cut-off is refreshing, because there’s something extremely comforting in knowing that nothing is left hanging in the balance when you’ve been watching a film for the best part of two hours. The ending had a fair bit of symbolism on display, or at least I took that from it. Blood was spilt and oil was spilt, which I feel represented the business that Abel was in, as well as his practices. As I’ve said, he tried to be the best man that he could be, and in doing so I do believe that he was keen to do the right thing, but he wasn’t interested in whether or not he was facilitating the growth of others. He didn’t particularly want to hurt anyone on his road to success, but he wasn’t going to pull anyone out of the firing line either. He caused damage to others because of the messy business he was in, and the fact that his victory came at the expense of an innocent man was fitting for the nature of the man that this film was studying. One of the last lines said in this film comes as Abel explains that he’s always attempting to take ‘the path that is most right‘, which I felt was a very clever choice of words. As a character Abel would never claim to be in the right, he would simply say things like ‘I run my business in a way aligned with normal business practices’; no claims are made about what these practices entail. “A Most Violent Year” is a film that’s more about conversation and nuance than it is about actual violence, but that suits my tastes just fine. My biggest problem with the movie is that I left the theatre with the nagging sense that things could’ve been that bit more exciting if the writers had been slightly more ambitious with the story. Throughout the film I thought that things weren’t quite as they seemed, that the characters weren’t what they were pretending to be, and while that was true in a minimal sense for Abel, it was only every implicit. That’s fine and it’s impressive that Isaac’s performance was subtle enough to convey a conflict between Abel’s motives, his values and his true personality, but what I was waiting for was that one mind-blowing moment to make this film truly memorable and exceptional, which sadly never came. That doesn’t ruin the movie at all, and you can certainly draw your own conclusions and believe what you wish to about the future of the characters, but I think that a really explosive ending would’ve brought everything together and taken this film to a significantly higher level.